In the first post of our two-part blog series on LPWAN technologies comparison, we touched on the 10 leading criteria for a successful LPWAN deployment. Using these criteria as a baseline, in our final post in the series, we evaluate and compare the main LPWAN technologies on the market. We hope that this provides more insight into the LPWAN solution that best suits your IoT projects and applications. LPWAN solutions fall broadly into two groups based on their operating spectrum: licensed vs. license-free. While all licensed spectrum LPWANs are derived from 3GPP cellular standards, the license-free landscape is much more diverse. Depending on their underlying technologies, license-free LPWANs vary significantly in terms of network performance criteria. These solutions cluster around three major technologies: Ultra-Narrowband, Spread Spectrum, and Telegram Splitting. Based on 3GPP standards, cellular LPWANs like NB-IoT and LTE-M use the licensed radio spectrum owned by cellular network operators. These solutions offer significant advantages including carrier-grade security, as well as reliability due to the fact that there is no co-channel interference from other systems. Adopting global cellular standards also means that hardware sourcing is easier and more flexible. On the other hand, QoS and scalability in cellular LPWANs are achieved at the cost of power efficiency. Specifically, the synchronous communication employs handshaking processes to avoid collisions caused by simultaneous transmissions. Though this approach improves scalability, it also incurs more overhead while making power consumption less predictable. A node may need to signal the base station several times before permission to transmit is granted which can increase energy usage significantly. Furthermore, the comparatively high data rates offered by cellular are often unnecessary for many IoT applications. These high data rates do not offset the compromises of other important factors such as range, power consumption, costs, and lack of mobility support. In particular, NB-IoT only supports communication from stationary end nodes. Also, contrary to common perception, cellular LPWANs do not offer a globally unified IoT communications solution. Currently, LTE-M networks are mostly rolled out in North America while NB-IoT networks are mostly deployed in Europe and part of Asia. In addition, due to the dependence on network operators’ infrastructure, it is likely that many remote and offshore areas are “out of coverage”. Unpredictable technology sunsetting in cellular networks also puts network longevity and long-term implementation into question. Operating in the license-free spectrum, Ultra-Narrowband (UNB) technology drastically reduces data rates to improve receiver sensitivity and range. Using an extremely small amount of bandwidth to transmit a signal, this approach mitigates noise level while allowing for high spectrum efficiency. The slow data rate however, translates into a very long on-air radio time, which imposes adverse effects on Quality-of-Service (QoS). A 12-byte UNB signal can have an on-air time of up to 2 seconds, making it highly prone to collisions in the air interface. In a crowded license-free spectrum, with large numbers of data points and traffic from other radio systems, network performance is severely impaired. Long on-air time also drains the battery faster. What’s more, to improve QoS, UNB networks may need to resort to factor in redundancy by sending the same message multiple times. This significantly increases on-air time and thus, the power consumption of each transmission. Under European regulations a duty cycle (maximum 1%) is imposed on radio devices operating in the 868 MHz band. In this context, slow data rates and long on-air time seriously restrict maximum packet size and transmission frequency. In the USA, FCC regulations set a limit of 0.4 second on-air time per transmission, requiring a different network design with a trade-off on range/coverage. Other limitations of UNB technology include limited mobility support as the long transmission time causes deep fading and packet errors under Doppler effects. Also, public UNB networks run by network operators many countries and regions suffer from a lack of coverage due to the insufficient network infrastructure run by network operators. On top of that, all messages must be rerouted to the centralized cloud platform of the technology provider, causing skepticism towards data privacy. Spread Spectrum technology is an alternative approach to improving range, without significantly compromising data rate as in UNB systems. There are several variants of this technology, with the most common solution being the proprietary Chirp Spread Spectrum. By spreading a narrowband signal over a wider bandwidth, Spread Spectrum converts it into a noise-like signal that is hard to detect and intercept. To compensate for the high noise floor and to improve receiver sensitivity, coding gain (or processing gain) is added. Higher spreading factors with more coding gain provide longer range at the cost of data rates – or on-air time. Major drawbacks of Spread Spectrum solutions include low spectrum efficiency and bad co-existence behavior. This is because the bandwidth used for transmission is much wider than the bandwidth required for information. In real-world installations where all gateways and nodes use the same channels for transmissions, the increased traffic within a Spread Spectrum network, combined with uncoordinated transmissions (asynchronous communication), causes message overlays. As a result, the receiver is unable to demodulate overlaid messages, leading to data losses and constrains overall network capacity. In a long-range scenario, the scalability problem gets even worse. To achieve the best range, the highest spreading factor is required. This increases on-air time and thus the likelihood of more collisions. The use of different spreading factors and bandwidths aims to improve network capacity by enabling simultaneous demodulation of multiple messages. Nevertheless, this solution requires more complicated network management. 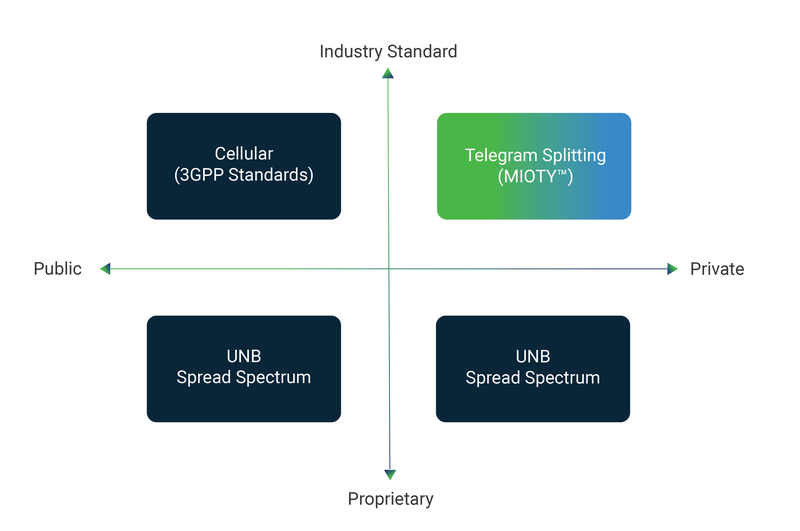 As the latest approach to LPWAN, Telegram Splitting is the only standardized solution in the license-free spectrum. The underlying rationale of this technology is that it splits a UNB signal (data packet) into numerous smaller sub-packets and transmit them at different time and frequencies – with transmission-free periods in between. Due to its significantly reduced size, each sub-packet has an extremely short on-air time of only 16 milliseconds. The accumulated on-air time of a message with 10-byte payload is only 400 milliseconds. As a result, Telegram Splitting networks can capitalize on the high spectrum efficiency of UNB while surpassing the major downside of increased on-air time. With its ultra-low bandwidth usage and low duty cycle operations (0.1%), the technology offers flexibility as it can also be configured to work in other sub-GHz ISM bands – outside the common 868 MHz (Europe) and 915 MHz (North America). Besides offering ultra-low power consumption, short on-air time – coupled with frequency hopping – drastically minimizes the likelihood of collisions. As a result, Telegram Splitting is highly immune to both inter- and intra-system interference. To add even more robustness and scalability, Forward Error Correction (FEC) enables successful data retrieval, even if up to 50% of sub-packets are lost in the air interface. Short on-air time and FEC additionally provide excellent resilience against Doppler effects, thereby supporting communications from nodes moving at up to 120 km/h. As a globally recognized standard released by ETSI in its TS 103 357 specifications, Telegram Splitting brings assured technology quality, vendor independence, and long-term interoperability to the table. MIOTY™ by BehrTech is the first and only solution that fully complies with Telegram Splitting. Selecting the right communications solution for your IoT project involves two steps. First, you need to determine which qualities are most important to your specific use cases. Then, you need to measure the different options based on the defined criteria. More importantly, not to forget the availability of these solutions in your region. Public LPWANs are great for Smart Cities applications thanks to their extensive coverage in urban areas. On the other hand, many industrial campuses are located in remote, geographically challenging areas not covered by public LPWAN owing to inadequate infrastructure. Therefore, private LPWANs are a better choice for industrial and commercial applications thanks to the flexibility in network setup and management. The above discussion compares the key LPWAN technology categories based on the most relevant network criteria. It is worth noting however, that even within each category, the performance of different individual solutions can vary. Key factors including security, operating frequency, and payload size cannot be generalized and need to be evaluated case-by-case.